Once again, P3, the cavernous underground art space at the University of Westminster, will be transformed into a vision of the future as the 2nd Kinetica Art Fair 2010 strides into town. 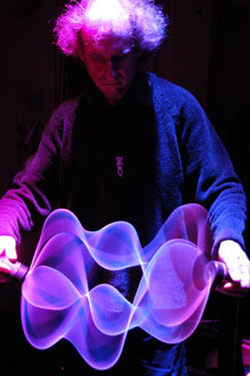 Expect to come face to face with holographic light beings and robots who sculpt and draw. An orchestral milk float looks set to take you on quite an auricular adventure and there's an intriguing giant, vertical electronic wave to discover. Comparable to the great international exhibitions of the Victorian era, which combined new developments in the arts, science and technology, there are over 25 galleries and organisations specialising in kinetic, electronic and new media art taking part and over 150 artists exhibiting. A special feature exhibition of work from the masters of kinetic art and the groundbreaking Cybernetic Serendipity show, along with talks, workshops, performances and opportunities to buy exhibits, all go to create this technologically triumphant and playful event. We have 5 tickets to win! Which 60's American sci-fi TV series featured a robot? Thursday 4 February - Sunday 7 February. P3, 35 Marylebone Rd (opposite Baker Street Tube), London, NW1. Day Ticket (includes fair, talks and performances) £14 / £12 conc. 4 Feb. VIP Opening Performance Spectacular limited tickets available. £20 per person no conc.